Satisfied with their work with Peter Collins on “Power Windows”, Rush felt he was the natural choice to produce their follow-up, “Hold Your Fire”. The album was lush with more of the electronic samples and flourishes that the band had indulged in on “Power Windows”, but later interviews would reveal the band was less satisfied with the result this time out. Certain songs were supposed to be given “The Full Monty” (as the band called it), with string arrangements and choirs, but in the end they were for a more stripped-down sound (or as stripped down as you can get with heavy keyboards and samples). I do confess, listening to it again in full, that some of the performances do feel a tad “off”, especially compared to later live versions. It feels like an alternate take or adding “The Full Monty” the band had talked about would have made all the difference on some of these tracks. “Hold Your Fire” would be a bit of a disappointment for the band, only going Gold instead of Platinum like their previous albums (breaking their streak for the first time since “2112”), but it occupies a unique space in their history as its perhaps the closest the band ever came to straight-up pop rock, even with the brighter tones of follow-ups like “Presto” or “Roll The Bones”. The album opens, ironically, with one of the last songs written during production, “Force Ten”. After the opening sample is out of the way, the band hits the ground running with one of their most energetic and immediate songs. This song is all about the little sounds tucked in the margins, with little sequencer and guitar overdubs tucked in all over the place. If a song is chosen by the band to represent the album, it’s typically this one. 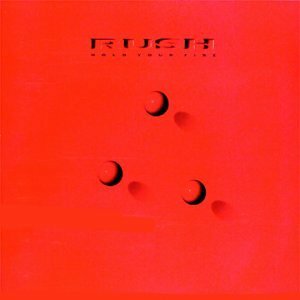 Like I said earlier, “Hold Your Fire” would be the closest Rush would ever get to straight up pop, and “Time Stand Still” would be the closest they would ever get to releasing a pop single (even more so than “Closer To The Heart”). The guitar is clean all throughout with no solo, it has a simple rhythm, and features ‘Til Tuesday frontwoman Aimee Mann lending back-up vocals to the chorus. Still, it’s a beautiful song and features some of Neil’s best lyrics. If Rush had to make this a pop song, they did a great job doing it. “Open Secrets” seems to have fallen through the cracks, having never been performed live by the band. I find this to be a shame, and I find I’m not the only one because a lot of fans seem to really like this song. It has a really haunting tone, and talks about the little things that seem to go unnoticed about us, even by those closest to us. Hopefully the band with re-discover this gem like they have others on recent tours, because this song deserves a proper day in the sun. All of Rush’s piano based ballads can literally be counted on one hand, and they started with “Second Nature”. I’ve talked previously how I like Rush’s sci-fi songs until they start overtly writing about sci-fi. This is an off-shoot of that: I like it when they sing about hope for humanity, but hate it when they get overt about it. “Second Nature” just feels like a generic protest tune, and really, Rush is better than that. “Prime Mover” would actually be the last single released for the album, and would only chart in the UK. Some of the rhythms and riffs feel a bit leftover from “Power Windows”, but the peppy tone definitely belongs to “Hold Your Fire”. I don’t know if I would have chosen it as a single, but it’s a fun song with lots of bounce (particularly with the midrange punch of Geddy’s bass) and hopeful lyrics. Another piano-based track, “Lock And Key” has the darkest tone yet. The pre-choruses would border on heavy metal if not for the bright production. I initially thought this was about nuclear holocaust like “Grace Under Pressure”, but it seems to talk more about “the killer instinct” and how we try to hide it away. Odd they have such a dark subject on such a poppy album. Things become more hopeful on the next track. “Mission” sadly was not released as a single, which is a shame because it would become a live favorite, and if all of “Hold Your Fire” had continued in this direction, I think it would have been better received. The production is lush, but not overdone, and Neil’s lyrics are spectacular, eloquent yet melodic. Geddy packs away the keyboards briefly and lets his bass take center stage again. “Turn The Page” is undeniably his track, Alex getting off his brief bursts of guitar most of the song. Lyrics talk about how we tune out the problems of others and the world to focus on our own. The song is energetic enough that I can see why it was frequently played live on the subsequent tour. We then get to “Tai Shan” and…eeeugh. I’m not going to lie. “Tai Shan” was a song I dreaded reviewing. Why? Well, I’ve mostly been charitable to some of the weaker tracks or weaker albums so far. For the most part, none of them are really bad, they’re just not as good as other songs on the album, or other Rush songs in general. …”Tai Shan” is different though. “Tai Shan” just straight up stinks. It’s easily the worst song on “Hold Your Fire” and may be the worst Rush song of all time. Inspired by a mountain climbing trip Neil took in China, this song couldn’t be more cheesy if it tried. It even goes straight for the piercing flute music to evoke an image of the Far East. Lyrics go little beyond “I’m on a mountain in China!”, but certain lines like “I stood atop of the mountain/And China sang to me” make me want to straight up barf. And I feel completely justified in saying all of this because Geddy Lee himself feels the exact same way. Let us move on and speak no more of this. Fortunately, the album closes much stronger with “High Water”, with Neil’s drums taking center stage again. This song would never be played live either, which is a shame I think because, like “Open Secrets”, it has the makings of another underrated classic. Like “Mission”, it soars more than it bounces, but it also percolates under the surfaces (particularly with the sequencers on the verses). Alex’s guitars particularly pick up steam by the second verse, and his solo is just magic on this one. In the end, “Hold Your Fire” is far from bad. In fact, it has a few songs that I’d love to see brought back to live sets some day. But it has some moments that straight up don’t work, or don’t represent Rush at their best. Songs like “Second Nature” and especially “Tai Shan” go right past earnest (which I usually applaud Rush for) and just become straight up cheesy, something I rarely ascribe to the band, even if others go out of their way to. At this point though, even Rush itself was getting tired of all the emphasis on keyboards. With technology being what it was at the time, running all the banks of patch changes and samples (all so the band wouldn’t have to employ outside musicians while staying true to the records) proved to be a huge hassle, and Alex Lifeson was starting to resent being shunted to the side as he had been throughout this era. WEAKEST LYRIC: I refer you to the barf worthy line in “Tai Shan”. EDIT: Turns out Alex Lifeson hates “Tai Shan” too!